The Volunteer of the Year for 2009 is Sandy Smith. Sandy Smith has a long history of volunteering in Mira Mesa community groups. 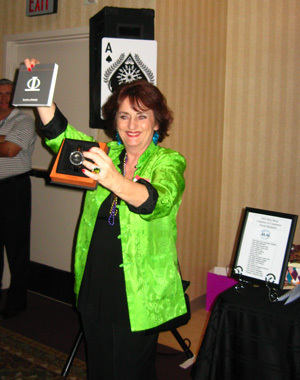 She is a long time member and past chair of the Fourth of July Committee. She has been a member of the Mira Mesa Town Council Board of Directors for four of the past six years, and an active general member for over a decade. She was the chair and organizer of the Volunteer of the Year dinner for several years. She has helped to procure food for Street Fair volunteers. She is also a long time member of the Mira Mesa Theatre Guild, having been on the Theatre Guild Board, and a participant in Theatre Guild productions, including Monster Manor and Breakfast with Mrs. Claus. Sandy is currently a business member on the executive committee of the Mira Mesa Community Planning Group and on the Hillery DAR subcommittee. She has been part of HEROES and the Mira Mesa Chamber of Commerce since their inception. She is secretary of HEROES and community liaison with the Chamber and Theatre Guild. She has also been a participant in the Stakeholders committee, Kiwanis, NEC and the Mira Mesa High School business partnership council. 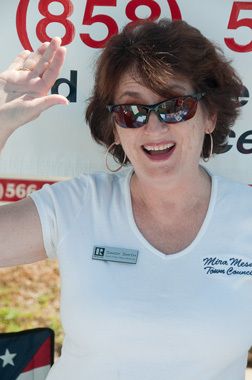 Sandy likes to connect our community groups and volunteers to each other, and likes to work behind the scenes to make Mira Mesa a better place to live, work and play. In addition to volunteering herself, Sandy is exceptionally good at bringing new volunteers into our community groups.